It’s not every day you find a bear in your back yard. And it’s certainly a once-in-a-lifetime experience to find one taking a dip in your hot tub. 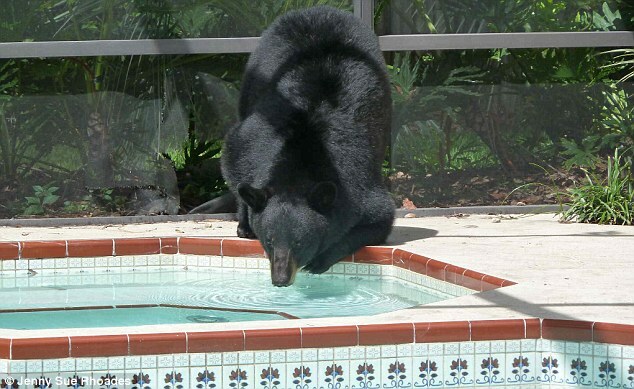 Jenny Sue Rhoades found the black bear swimming in her hot tub two miles from Wekiwa Springs State Park in Florida. 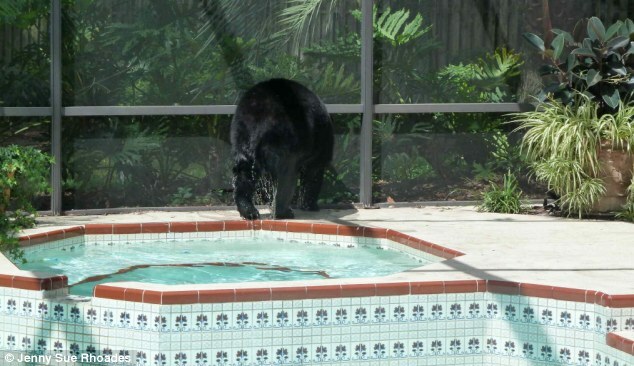 She told WFTV that she never turns on her hot tub in the summer because no one uses it – that was until last Friday morning when she looked out her window and a black bear was in the backyard. She said: ‘I should have yelled at him for leaving dirty paw prints around the spa. I went in my office and I got my camera, by the time I came back out his nose was pushed up against the screen. 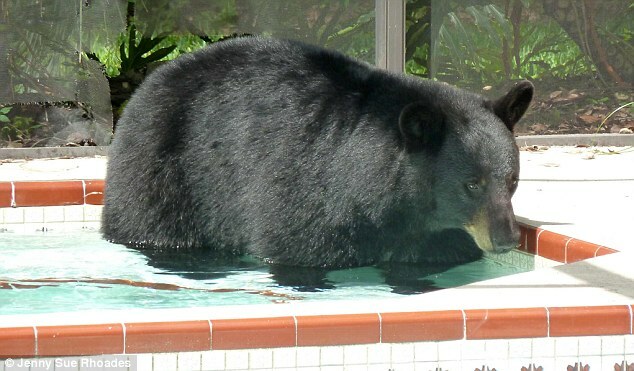 She said the bear then broke the pool screen, climbed through and started drinking the water in the spa and even though she yelled at the bear, he ignored her. Florida Fish and Wildlife said there are roughly 3,000 bears in Florida and their population is growing. There are so many black bears in the state they are even considering taking them off the threatened species list. He said: ‘It will come across between just exactly where that sign is. Florida Fish and Wildlife said that getting bear resistant trash cans and only putting out the trash in the morning of pick-up day will help prevent occurrences with bears.